Innovative teaching and learning solutions can positively impact instructional results. Developing collaborative relationships are essential for success. Providing excellence in service is a "must". Our education system is complicated. We can help. Using a deep-data dive, we'll identify instructional gaps and learning opportunities. Together, we'll create relevant, impactful professional development experiences for your organization. We are committed to delivering professional development that is relevant and valued by our customers. Well organized, clear and understandable. Worth time and effort to attend. “S²TEM Educational Consultants used a collaborative format that allowed teachers to share ideas from their own teaching experiences. Participants valued these ideas and were ready to implement them into their classrooms." We are proud of our over 25 years of experience. 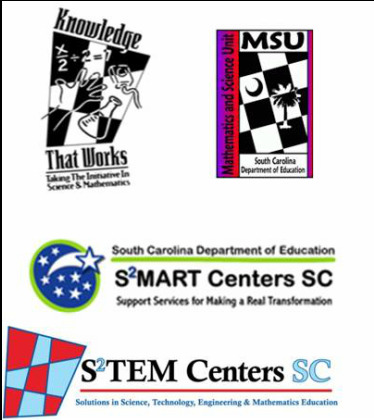 Established in 1993 in response to specific and persistent challenges in both student performance and access to resources the S²TEM Centers SC network is nationally recognized for designing and delivering professional learning experiences that build the capacity of districts, schools, and teachers to engage students in STEM. Though our name has changed, our vision for STEM learning remains the same. Every day, in every place where STEM learning occurs, people experience the "WOW" that brings them back for more! Back in 1993, we began with funding from the National Science Foundation's Statewide Systemic Initiatives Program and a very complex logo. Let's take a look at the original logo and how it informs our work today! Knowledge that Works - Giving educators access to knowledge to do their work better and kids knowledge to be gainfully employed. Today we call that workforce development. Math Equation (albeit a rather weird one), Computer Mouse (with a cord no less), Hand of a maker and doer, Beaker. Today we call that STEM. The Icon Shape/Checkerboard Pattern - A puzzle…unanswered questions…an attempt to bring together things, ideas, actions and people along with all of their uniqueness in a way that adds power, value and effect. Today we still seek answers, make connections and create solutions.